I've come to the realization that I'm a perfectionist. As I took these photos I kept thinking, oh wait, I wanted to make this, or change this, or add this and really hesitated taking the photos at all. But then I thought that if I don't take the photos now, who knows when I would feel like it was "complete", and with a baby coming, who knows when I would do the projects I wanted done. So. 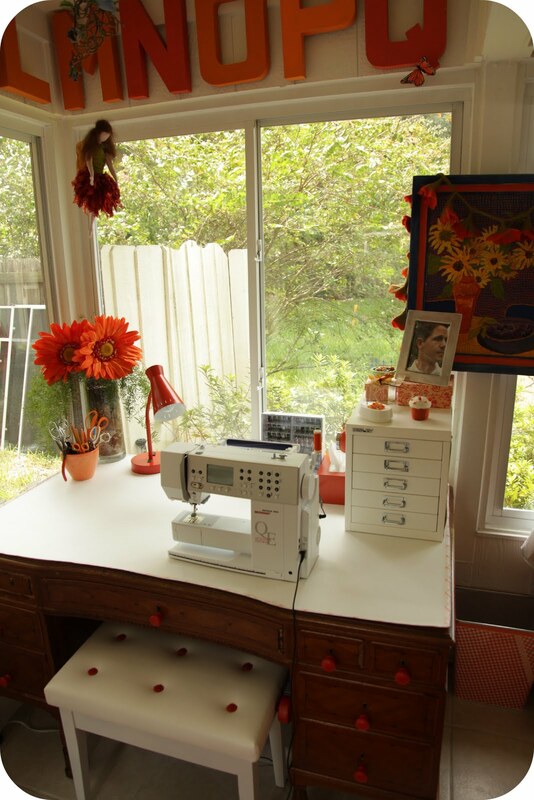 Here it is, my Never Enough Orange (NEO) Sewing Studio! I covered both my giant antique desk and retro green kitchen table with the same white faux leather I used to cover my sewing bench and sewed some orange and white plaid bias around the edges. I took the knobs off the desk and spray painted some inexpensive ones, saving the old ones for fear that one day we'd take the desk to Antique's Roadshow and they would tell us, if only you had the original knobs, this would be worth 2 million dollars ;). 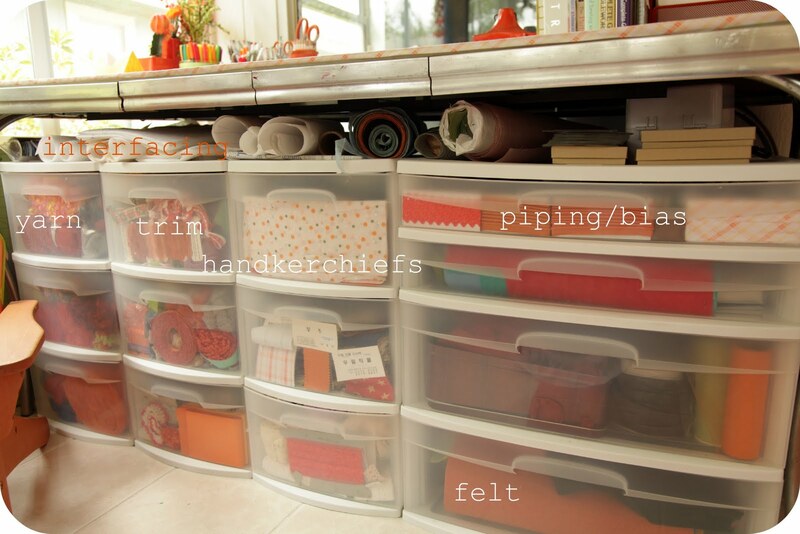 Now my fabric doesn't even get to reside in my Never Enough Orange Sewing Studio, but I do have most of my notions and other sewing supplies stored under the table in clear containers. I placed an orange sample of what they contain in the front instead of labeling them since little hands would most likely pull the labels off within a matter of minutes. Behind the drawers is our emergency water containers, so the drawers can't get pushed back very far. I used a paper holder and plastic containers to store some of my supplies such as embroidery thread, beads, covered button supplies, and random odds and ends that I manage to collect. I would eventually like to replace this with a cool vintage miniature cupboard with lots of little drawers (orange, of course) but I haven't happened upon such a treasure as of yet. I also keep handy a few of my sewing reference books on the table for easy access. Even though they might contain out of date (or uninteresting) projects, I really like the Reader's Digest books for Sewing and Needlework. They hold a huge amount of techniques that I browse through every once in a while when I need a refresher on something or to learn how to do something differently. I kept killing my orange plants except for the succulents, so that's what I've finally stuck with (and those artificial flowers in the back). My markers, pens, and pencils are on the table top for easy access. Plus scissors. Never too many scissors. My dad emailed me one day and told me I needed this vintage Florida beverage tray he found on Etsy. Being the obedient daughter that I am, I promptly ordered it and enjoy it with some of my favorite threads and yarns from Habu. 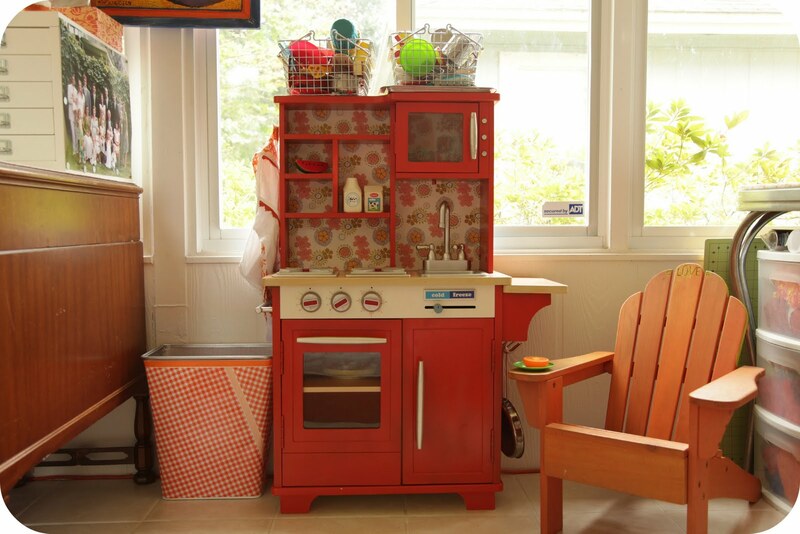 The play kitchen had a makeover as well with some spray paint and wrapping paper as the backsplash. It was a lot more involved than I thought, but worth it. Azure and Clover love this little kitchen and I love to be served their little meals. The garbage can is just a wire basket that I covered with some oil cloth and taped with some decorative Japanese tape. Where I slave away ;). I love how bright this room is. It makes for a happy seamstress. The painting was done by my dad and the felted floral vine I snatched up from ABC Carpet & Home in New York on our last visit. I'm not sure what I'm going to do with it yet, but I knew it needed to come home with me. 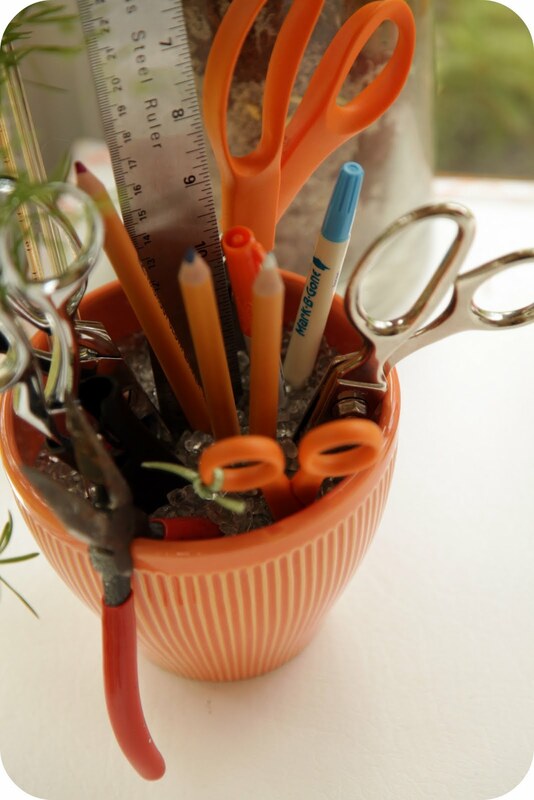 I filled a vase with glass pebbles to keep my much used supplies easily accessible: fabric scissors, fabric pens and pencils (separated from other types of pencils), and rulers. 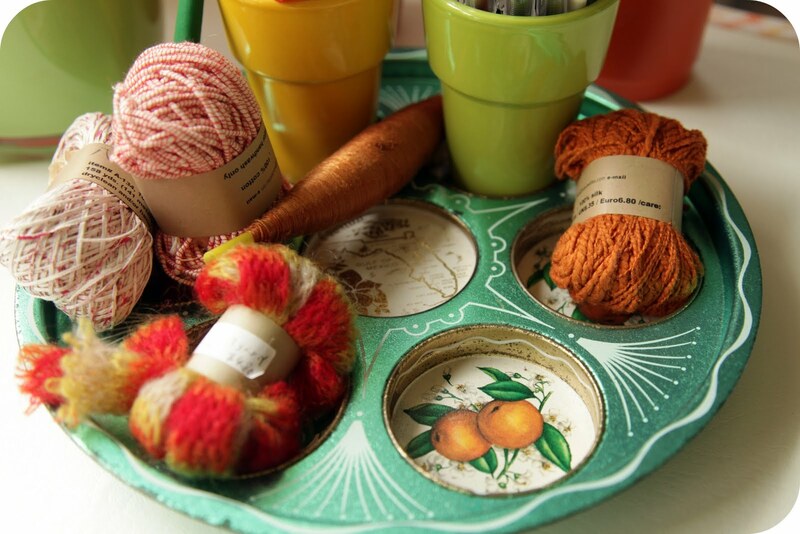 In my mini Bisley drawers I keep more beads, needles and other odds and ends I use in my sewing projects. 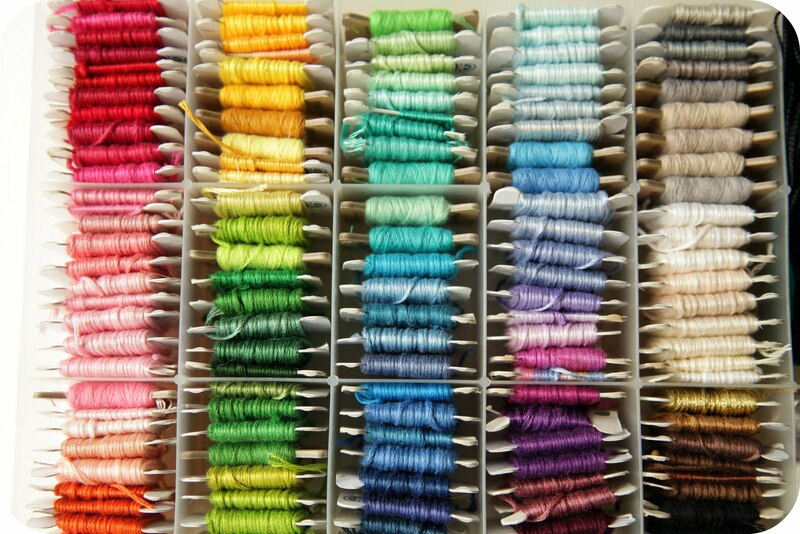 The drawers in this desk are d e e p, perfect for storing my thread rainbow. Of course when someone accidentally pulls them all the way out, it makes for an annoying clean-up, but luckily that doesn't happen too frequently :). 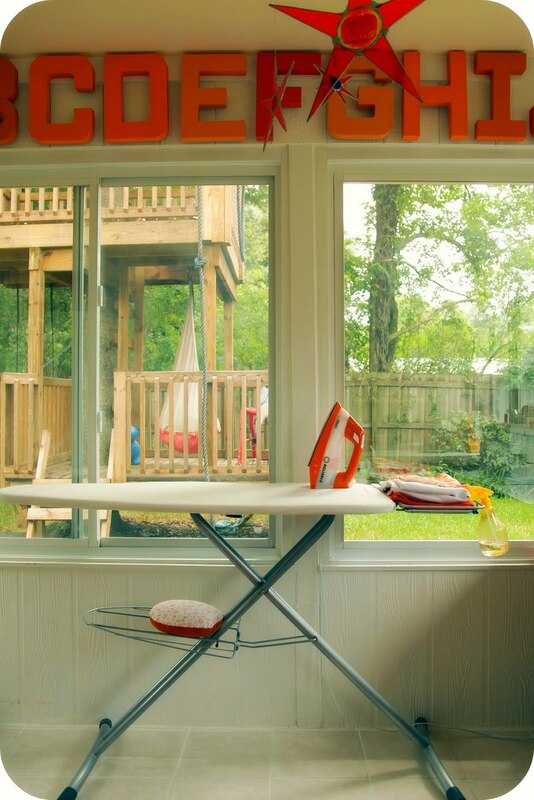 One of the most beloved features is having my ironing board right next to my sewing machine plus a view of the kids playing in the backyard. Still loving my Reliable Iron. 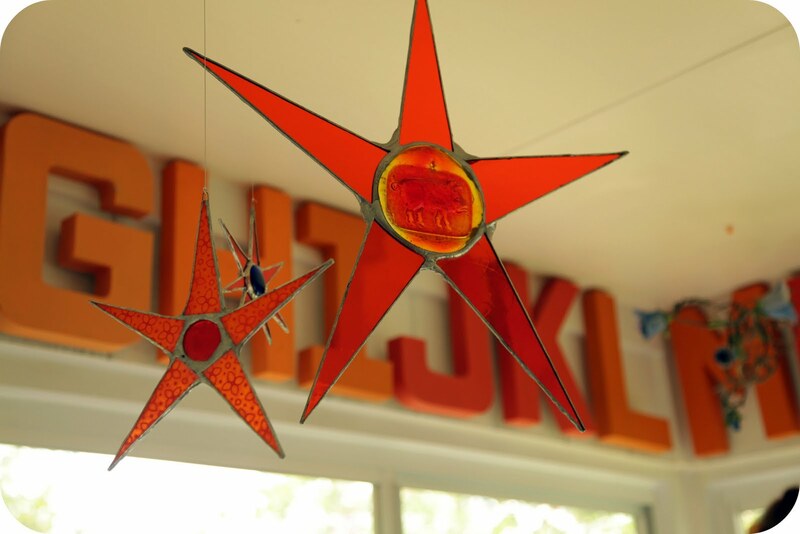 Do you know where to get your very own stars yet? And did you notice my new baby of the plug-in variety? Yes. I'm spoiled. Bernina is closing out their 400 series and so she came home with me for my birthday. She's a beaut. What should I name her? Her little sister won't be going anywhere, but turned into the sewing machine for my girls so we don't have to argue about who took my thread out of here?! View from the desk: This is where all the art supplies and games are kept. I feel spoiled but very grateful to have a dedicated space for creating after 11 years of marriage, but for those who just have the kitchen table or a corner of a room, it doesn't mean your sewing is limited, you just have to get more creative. We've always had limited space in our petite apartments and houses, but that hasn't stopped me from sewing where and when I can. I once sewed an apron on the floor of a closet. Where's the strangest place you've sewn? There you have it! Of course I will continue to share the projects I complete to make it even more orange-y orange :). I love it and all the details are so thoughtful and functional! 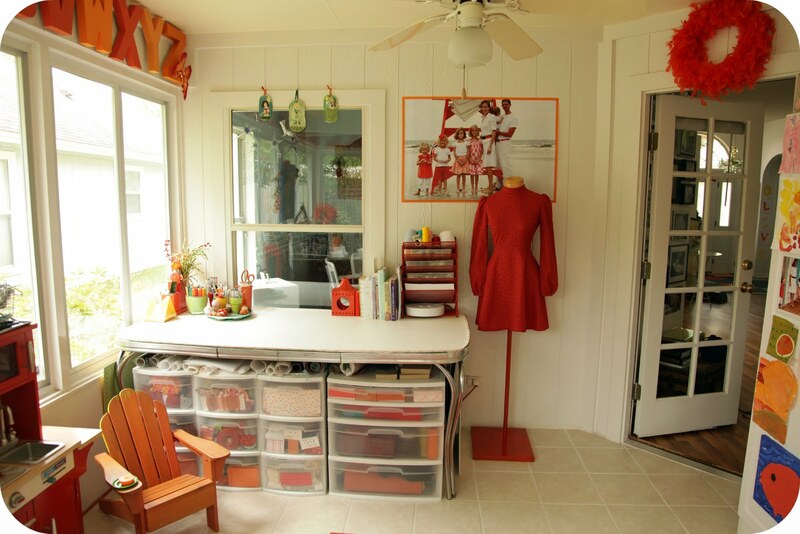 Love your new sewing-studio! I'd just love to have a room like that. I do my sewing whereever there is enough room to put my sewing machine! All the best for the last days before the baby comes! Such a gorgeous room! I have a sewing corner, at least. I actually took my sewing machine to college, and did a fair bit of sewing in my dorm room! 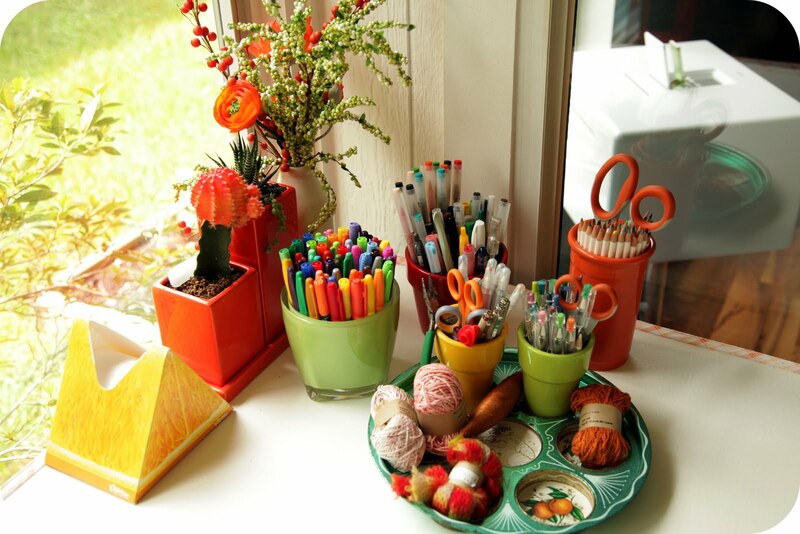 What a bright, cheery and wonderfully Orange space you have created. Congrats on your new room and I hope it inspires you more amazing projects. now that is just an extremely well done space. love the space for the ironing board to stay permanently up and the views both into and out from the room. Oh I just love it! You've done an amazing job making this space not just your own, but one that the kidlets will be able to join you in. I especially love all the windows/natural light! Ohhhh you give me something to aspire to. Lovely job, just lovely. Uauuuu!! !Is wonderfully, love,love, love orange! Great job! I love the letters and the artwork. Another wonderful Katy creation. I too, wasn't always fond of orange, it is now one of the colors I'm craving more of. Great job!! Such a cheerful place and the little girls can still be part of your private place. Such a tease! I even knew this post was coming...but I thought "The Great Reveal" meant we got to know if it was pink or blue :) Beautiful studio, though!! I love it. Great perspective on the last window. Almost storybook like. I often feel guilty of having my very own room to myself now (took me 10yrs to get it. I just remind myself of the times I crammed my machine at one end of the kitchen table while the boys ate at the other end. The worst place: sewing in the bathroom once. We were in a 2 bdrm temporary apt with 3 boys, 2 dogs for 6 months. oh i love it! Beautiful, cute, makes me want to sew in there. And that family photo is gorgeous. Well done Katie! I love it! Just beautiful! And I love that you can see the yard from that window. Enjoy the last few moments of pregnancy! Amazing! I love how you put space in there for your girls to spend time as well! This is a dream!! I'm so jealous, I love it all. I have half a room that I have to evacuate whenever we have company :) Someday...! very nice! I love the windows, so much light! Congrats on the arrival of your Bernina! Oh so wonderful and dreamy. I love your windows in that room so much! So bright and cheery!!! Now it's making me re-think my future craft room! I love it and orange is my least favorite color. I'm starting to rethink orange now. Oh how I would LOVE to pick your brain about garment making in your beautiful studio! What a fun and happy place! I love it! :) Congrats on your new machine too. I'm still sewing on the corner of the kitchen table when we don't have company. Orange is my favorite color, and I just love your studio. I hope to have a similar space in the future. SO FRESH and fun and bright! I have studio envy (mine is in a part of the basement with no windows). Awesome, awesome space! Orange has always been my FAV color! My sewing space is in my bedroom. Hopefully one of these days, I can have a sewing studio like yours!! Wonderful job!! I must admit that although I read your post yesterday, "The Great Reveal" made me think "Baby?! "...but soon enough and in the meantime your studio is beautiful!! I am a "hogger of the kitchen table" sewer. Someday I will get my own room! I never put my machine and serger away (unless we have company for dinner) so it is always ready and waiting. I recovered my first baby's carseat sitting on the couch with my sewing machine sitting on a very small and low coffee table in a tiny apartment! Love the family picture on the beach of everyone in white and what else, orange! It's just so perfect! NOW the baby can come. I once took "Little Shop Of Horrors" on the road (drew the short stick while working in the costume shop), and the outdoor ampitheater flooded. Luckily my costumes were on racks, but I had to fix seams by hand while sitting up on cabinets with a half of foot of water on the ground. What a fun sunny room. I think one color really unifies a space (albeit a small space) and makes it look so much happier. Definitely something I've learned today. PS: I think if you have a baby girl you should name your sewing machine a boy name like Roger. "I think I'll go spend some time with Roger." Being a lover of orange myself, I think you missed one opportunity to orangify your room. The while ceiling fan needs to be painted orange, or at least the blades. It would look fantastic. Happy sewing. Looks great! I often sew on my dresser top. I have a little built in corner desk where I can do small things, but there are so many other things there I can't really do big projects. And I pretty much always pin/lay things out on my bed, so it makes sense to sew on the dresser. I used to sew on our dining room table, but since I do my sewing late at night and it's now adjacent to my two-year-old's room, that's out. I do my best, but I do dream of someday having a dedicated space! lovely katy, I was hoping we'd get to see the whole room together soon! :) beautiful! When you bite into a just picked orange- it is truly refreshing! 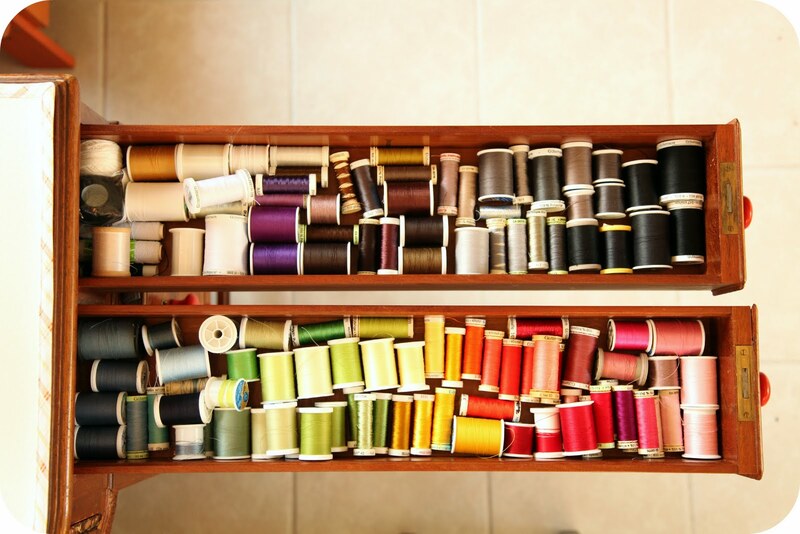 That is how your sewing studio is! Truly a relaxing place! Love it! I am now encouraged to reorganize my sewing nook- right now! terrific space. i love love love the orange. You should name your machine Bernice. It's a perfect name for a sewing machine. LOVE the letters! The strangest place I've ever sewn was on the floor of my apartment, in the middle of moving. I was making costumes for a musical, and because of some bad timing issues, ended up having to work on everything while also trying to pack boxes and move. After I'd moved into my new place, I had to finish sewing on the floor because my deadline was so tight I couldn't even wait to get my table put back together. I had to wait two days to unpack so that I could finish the costumes. i have a little curly headed blonde boy wearing an orange t-shirt you can have for your NEO studio...although, i should tell you he comes with a VERY smelly nappy (diaper) and a snotty nose. I just sewed my daughter a dress with the sewing machine sitting on a tv speaker and me sitting on a small u-haul box! Ha! The things we do! I love it ... so bright and fun! Thanks for sharing! SO organised and tidy and I can't believe you were doing all this while you're about to pop and have 5 kids already. Amazing!! Wow, what a fantastic creative space!!! Love all the orange accents and the fact that you can watch the children play in the backyard with all those fabulous windows!!!! Ideal! The strangest place I've sewn anything is in a hotel room. I am a scrapbooker/card-maker and my best friend and I managed a girl's weekend away to scrapbook. We rented a hotel room and did a bit of shopping, but mostly creating. 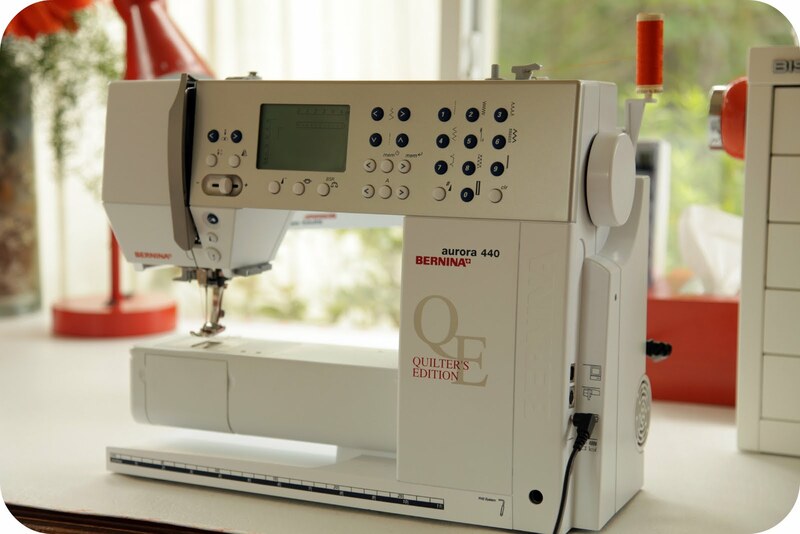 We often use our sewing machines in our projects, so we brought one along. In addition to sewing on the cards we made, we managed to get the dust covers for both our machines done, a project we had been wanting to get done for ages. It was a fab weekend! I started reading your blog because of NEO! 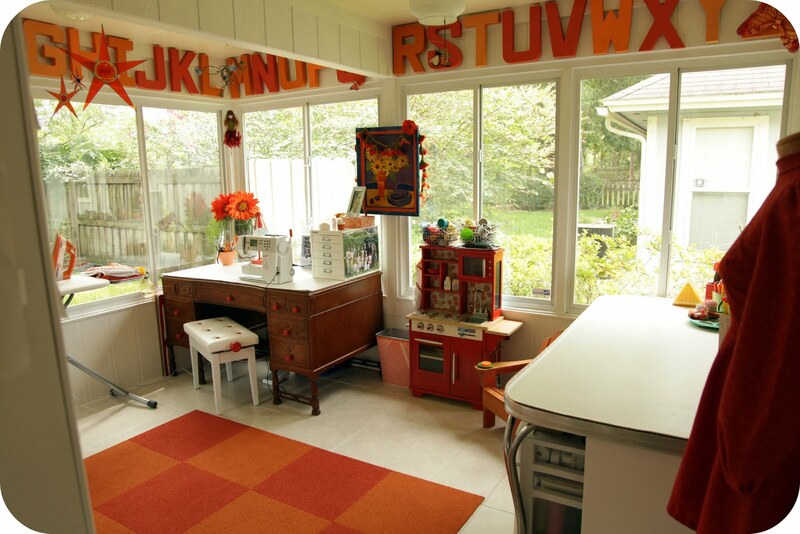 Orange is my current favorite color, and I'm dying over your sewing space--love it. I'm especially swooning over the alphabet letters. And the windows--oh the windows! So open, so pretty. This space is pure delight. WOW! It is an inspiring place and deserving of your immense talent. Great space, I'm so Jealous! I am a samurai sewer, having sewn in the lobby of both girl's dorms (midnight pajama pant mania!) and the boy's dorm (when I lost my mind and helped them make 32 kilts). I have sewn from the passenger seat of my 68 VW Beetle (with a cigarette adapter!) and on the floor, bed and hallway in my own Dorm. I have always dreamed of sewing outside, but guess that's not terribly practical. What a beautiful view you have from your studio! I also love the way you coordinated everything in orange. So bright and cheerful!!! Okay, names for your new sewing machine . . . I tried to come up with an "orange" name. 1-I am genuinely happy for you that you finally get a sewing room! 2-How did you make your dress form stand orange? 3-Love that you are using your big button box! 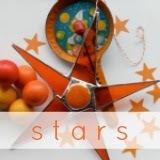 4-Whenever I see something orange, I think, oh, Katy would like that! 5-I'm jealous of your new machine but glad you have it, you certainly deserve it. I still have fond memories of you, me and mom getting our first Bernina together. Lovely! 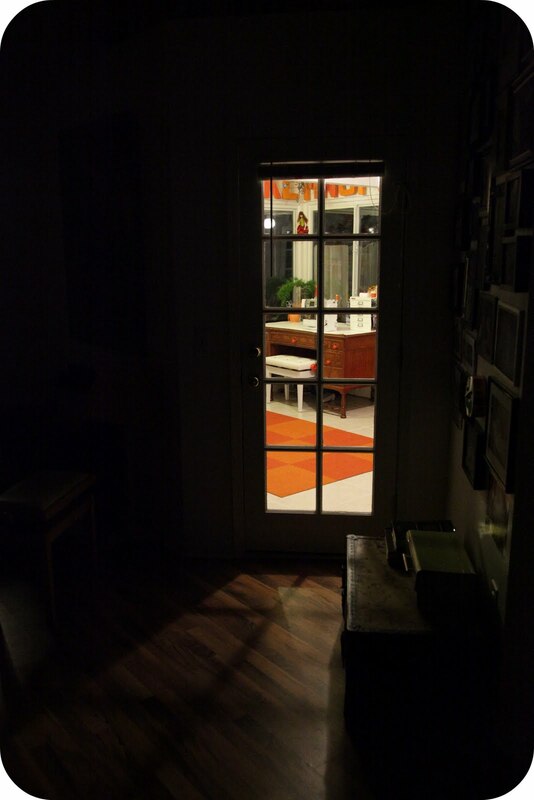 Now paint the inside of that french door orange and you'll be done! You know you've already considered this. Just do it! OMG it's so lovely! I can't wait to get out of my apartment and get a house so I can start my craft room. I'm so jealous, simply Beautiful! Thanx for sharing! Every single inch of it is awesome! You completely deserve it! Its so cool how you can see the back yard from it! What a lovely creative space. I'm slightly jealous of all that light! I'm a corner of a room seamstress but that is already a step up for me so I count my blessings. I have the Reader's Digest Complete Guide to Needlework book too and even though it's old like you said, it's a great reference! Ya know, I've never really liked the color orange. You've made it grow on me. Well done! It looks like heaven to sew in. So nice! Orange is such a good color to play in. Love your style. 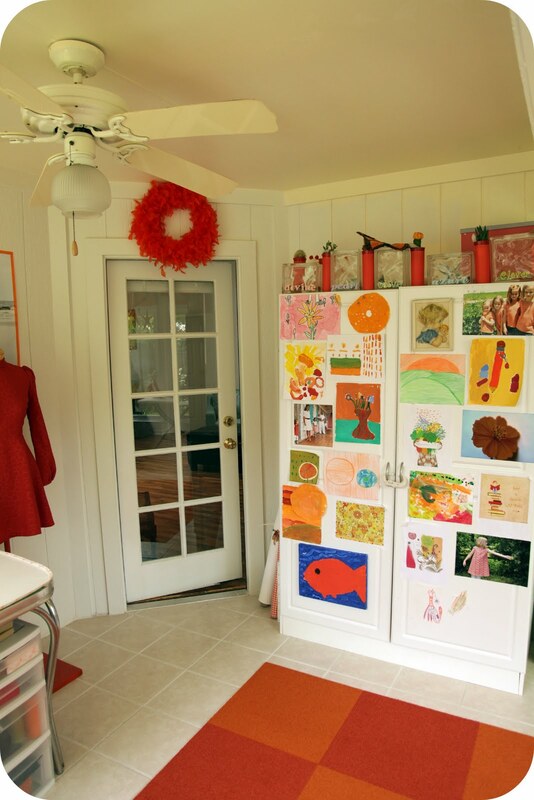 Love your sewing room. Especially love how bright it is, and the orange is great. know you must of had lots of fun planning and creating!! The desk is great, and to have Ryan's picture right there, neat thought!! Thanks for sharing! i'm so jealous of the feeling you must have of everything in its right place! yes, there will always be more to do to make it the perfect space, but i'm already just so jealous of the insane organization! thank you for the grand tour. so many wonderful ideas you've so graciously shared! may your deeds be as graciously rewarded with a smooth + delightful labor and delivery! LOVE it. 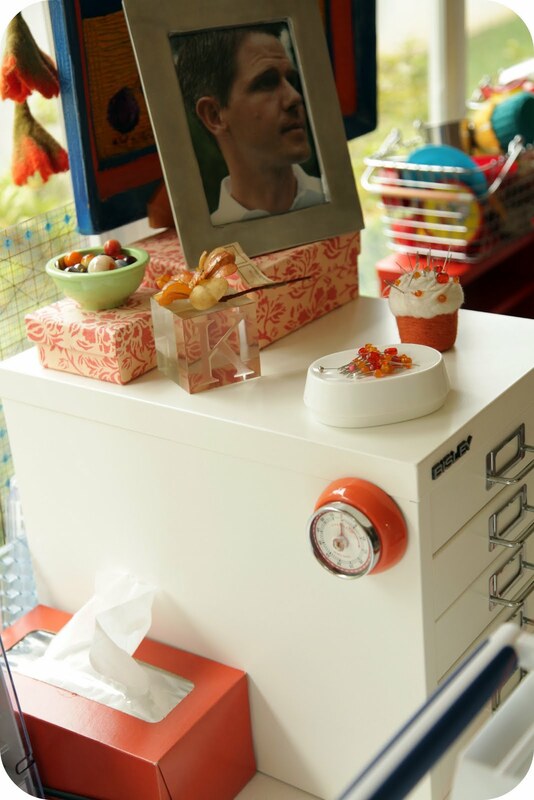 I'm not a huge orange fan, but I LOVE it in your sewing room. I've been visualizing bright orange paint all over the walls, but what you've done is spectacular! Looks fantastic, really bright and cheery and just a happy place to be! I too have the readers digest book, was my first sewing book and I still refer to it often. Wow. This is something I can only dream about. Thanks for sharing. I love orange! Ohh my !!! <3 <3 I'm drooling!! And I <3 your Habu!! Gorgeous space! I hope you are happy with it, though I know the nagging of hte perfectionist mind. I hope the baby arrives soon and wish you well with the arrival. WOW. What an amazing space. And also, I <3 your family picture! What a fabulous idea! Hi Katy, yes, you truly are blessed. Hope the next one is a boy just to mixed it up some. Wouldn't those girls spoil him if it was. They'll spoil anyway. I"m following you now and hope you'll follow on mine too. Helps me to stay in touch. just found this on pinterest and I LOVE IT! Hi...just found you over at Taylor Made. 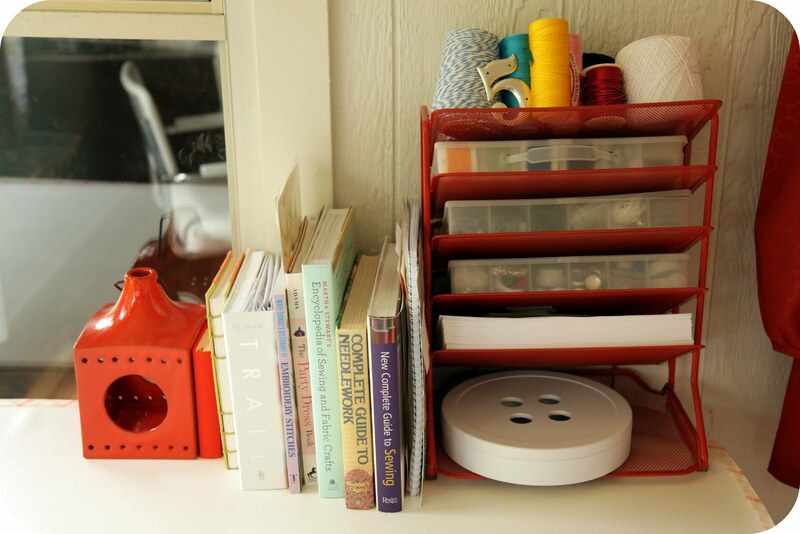 Love your sewing room. I just added my link to the party too. Seems like we have similar rooms...is yours on a porch too. My room is a three season porch. It has thermal windows, but no heat out there! I'm thankful for my space heater in the winter! I just stopped over from Taylor Made. So many great ideas you have! I am currently trying to figure out how to combine my sewing that is in the basement and my scrapbook which is upstairs in a little room off the Master Bedroom. You have such a wonderful room! So jealous your room is marvelous!